Far from being the staid lectures academics attend, symposia in ancient Greece were wine-stravaganzas. 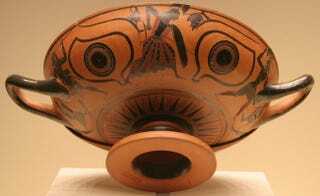 The kind of cups the Greeks drank from turns out to say a lot about them. At these symposia, drinking was mandatory. At first they were just for the elite, and the cups were just meant to get the wine to their mouths. As Greek society opened up and egalitarianism set in, symposia were held by everyone — so the styles of wine glasses expanded, since everyone was looking for the new, trendy thing. Apparently it took 200 years for the Greeks to get sick of 'stemmed vessels' and towards the end of the classical period, designer knock-offs plagued the market. In another 2000 years, I wonder what archeologists will make of the wide-mouth trend. Find out the complete history of chugging at Physorg.